The gesture by Mukesh Ambani to bail out his brother, Anil, is the latest twist in a sibling saga that has gripped India’s telecommunications industry. A price war started by Mukesh in 2016 nearly put Anil out of business a year later. Last month, India’s top court ordered Anil Ambani and his company, Reliance Communications, to pay a 5.5 billion rupees ($80 million) debt to Swedish mobile firm Ericsson (ERIC) by Wednesday or face three months in jail. 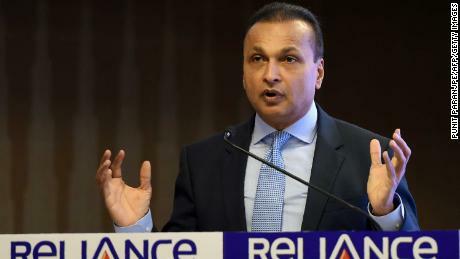 Reliance Communications said in a statement late Monday that it had made the payment to Ericsson in full, with Anil Ambani thanking his brother and sister-in-law for their help. “My sincere and heartfelt thanks to my respected elder brother, Mukesh, and Nita, for standing by me during these trying times, and demonstrating the importance of staying true to our strong family values by extending this timely support,” he said. A spokesperson for Mukesh Ambani’s company declined to comment on how much of the 5.5 billion rupees he provided, but local media reported it was around 4.8 billion ($70 million). The brotherly bailout is striking because Mukesh Ambani played a part in bringing his younger brother’s business to the brink of collapse. The Mumbai billionaire stunned India in September 2016 when he launched a new mobile network called Reliance Jio that offered customers six months of free high-speed internet. Anil Ambani’s company, once one of India’s biggest mobile players, announced in late 2017 that it would sell its main consumer mobile business to Reliance Jio in order to focus on providing data services to corporate clients. That deal has now been abandoned, the two companies said Monday. An Indian bankruptcy court will instead auction off Reliance Communications’ mobile assets to pay off the company’s $7 billion debt. 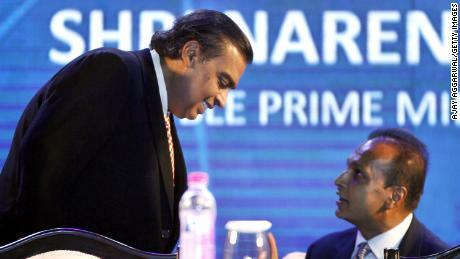 The Ambani brothers have had a tumultuous and often acrimonious relationship. After the death of their father in 2002, they waged a bitter succession battle for control of the vast Reliance business empire that he had spent decades building. In the end, they divided up Reliance’s array of businesses that cover industries such as energy, retail and financial services. But their fortunes have gone in vastly different directions since then. Mukesh Ambani’s fortune tops $54 billion, while his younger brother has dropped out of the billionaires club and is now worth only $300 million, according to Bloomberg. “I and my family are grateful we have moved beyond the past, and are deeply grateful and touched with this gesture,” he said.